Thankfully Happy Ghoul is rotating out. Arena card, but a decent one. Not a big fan of this one. Probably useful in arena but not impactful enough for constructed. 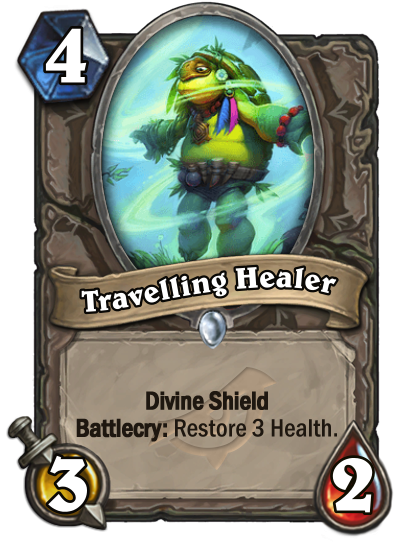 Divine shield can be very strong in some situations and synergy with other cards like Corpsetaker but only will see play in Arena. Peter Whalen said it best, "It's a card." Abit expensive but looks compatible in paladin decks. So a Kung fu panda reference ? It is not a strict powercreep over Silvermoon Guardian but pretty damn close to it being it. My first instinct was 100% arena card, inferior to Earthen Ring Farseer in almost every way. But after playing this game for so long, I've seen many unexpected cards see play. Perhaps the combination of divine shield in addition to the +3 heal can find it's way to fit into an EXTREMELY specific deck type where Silvermoon Guardian and Earthen would have been used in in place of this. Although, no one really uses those anyway. A fine card. Not great, not objectively terrible. Decent in arena, where healing and sticky minions matter. Divine shield and healing have mild Pally synergies. I feel like it will be a fine card to round out your deck that needs a few of those tools, but you wouldn't build around it. If you pull it and don't want it, at least it's just a common, and not the kind of letdown that Duskfallen Aviana would be. Should be 3 mana. Way too weak to see constructed play. It's not as bad as most people are saying, Silvermoon Guardian has a rating of 113 currently which is considered ''above average'' from a Arena standpoint. This card is more powerful with 3 heal, normally that one less HP won't matter. 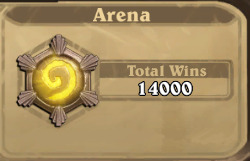 You can expect this to rate around 120 which is in ''Good' territory, while it will see zero or minimal play in Constructed it will be ''Good'' in Arena. I reckon best with Priest (Auchenai Soulpriest, Auchenai Phantasm) synergy.